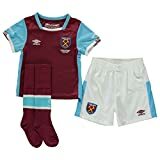 The Umbro West Ham United Home Kit 2016 2017 Mini Kit is ideal for letting any young Hammers fan wear whilst practicing their skills. The kit consists of shirt, shorts and socks for a great look. The shirt features the new team crest on the front of the top along with Umbro branding and Club sponsor. The shorts feature an elasticated waist for a secure and comfortable fit, with the socks completing the kit and look.